Francis was born in 1944, left public school at the age of 16, and started an engineering apprenticeship in a Manchester locomotive works. Later he gained a BSc in Sociology as an external student of London University. He worked for seven years in the Civil Service, mostly as an immigration officer at London Airport, during which time he studied Arabic. Between 1975 and 1977 Francis walked from London to Cairo, spending eight months in Paris, three months in Vienna and three months in Israel on the way. After marrying Angie back in Vienna, where he’d met her on his walk, they returned to Cairo to work in a secondary school for a year. From there they travelled on round the world, spending three months in Tokyo. Their son, Philip, was born back in London in 1979, after which they moved to Saudi Arabia where for nine years Francis worked for the national airline, Saudia, in English language training. Their daughter, Julia, was born in Jeddah in 1982. On their return to live in Brighton in 1989, Francis studied in London for an MA of Antioch University, Ohio, in the Psychology of Therapy and Counselling. He went on to do doctoral research at the University of Sussex on the early psychoanalyst colleague of Freud, Wilhelm Stekel. Meanwhile he started to practise as a counsellor in primary care, and also privately. Francis’s doctoral studies took place in the context of the Centre for German Jewish Studies at the University of Sussex. Through this Centre he was contracted to translate a number of German-Jewish books, including a biography of Theodore Herzl, the founder of modern political Zionism. But as a strong supporter of Palestinian rights, he found the pro-Zionist and Jewish-chauvinist atmosphere of the Centre problematical. How could the Palestinians succeed against the powerful narrative which the Centre demonstrated? It was this question which led him into active campaigning for the Palestinians. He served two terms as Chair of Palestine Solidarity Campaign between 1998 and 2001, and meanwhile founded and chaired the Brighton & Hove branch. Sometime after gaining his doctorate in 1999, Francis inaugurated a series of classes under his organisation called ‘Invitation to Learn’ ranging across psychology, sociology, philosophy and politics. These finally ended in 2010 when Francis was diagnosed with prostate cancer, for which he has been successfully treated. He has also retired from counselling. 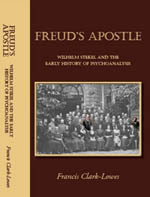 At the beginning of 2011 he published his doctoral thesis under the title Freud’s Apostle. In April 2011 Francis was expelled from the Brighton & Hove branch of PSC for alleged anti-Semitism, following his questioning of aspects of ‘the Holocaust’. A month later he was expelled from national PSC for the same reason. In January 2012 he unsuccessfully appealed his expulsion from national PSC, thereby fuelling a debate about PSC’s preoccupation with the sensitivities of Jews at the expense of the Palestinians. Francis separated from Angie in 1995, and in 2009 he married Christine at the Unitarian Church in Brighton. Since then they have both become members of this church and are much engaged in its work. Francis's interests include walking, classical music (especially Bach and Schubert), family history and biography.